Texas came out victorious in the 2018 edition of the Red River Showdown, defeating Oklahoma, 48-45, at the Cotton Bowl on Saturday. Sam Ehlinger shined for Texas, throwing for 314 yards, running for 72 yards and finding the end zone five total times. Receivers Lil'Jordan Humphrey (nine catches for 133 yards and one touchdown) and Collin Johnson (six catches for 81 yards and one touchdown) also played a major role. Texas' most recent victory in the Red River Showdown was in 2015. Now, the Longhorns have injected some life into this rivalry once again by ending their skid. Coming off a record-setting performance against the Baylor Bears, Murray had an opportunity to put himself among the front-runners in the Heisman conversation. Even with the loss, he proved he is deserving of consideration. It was just a week ago that Murray tied reigning Heisman Trophy winner Baker Mayfield's school single-game record with seven total touchdowns...in a game he was suspended for the start of. Early on, it appeared it would be more of the same this week as he led the Sooners to an opening-drive touchdown. However, he struggled in the game's middle portion. He threw a brutal interception in the first half that led to a Longhorns field goal and would ultimately help Texas gain control of the game. And things didn't get much better after the break, as Texas ultimately pulled away to a 21-point lead. But Murray is a special player who can will his team back into games. Down 45-24 to his archrival with less than nine minutes to play, Murray didn't give up. He put his team on his back and went to work. The 5'10", 195-pound dual-threat star led his team to three consecutive scoring drives to even the score. And it was his 67-yard run to make it a one-possession game that really sparked the comeback. Three drives, 178 yards, three touchdowns. And all that with just three minutes and 16 seconds of possession. Entering this game, Murray found himself in the company of Alabama quarterback Tua Tagovailoa and Ohio State quarterback Dwayne Haskins among the Heisman favorites. However, Tagovailoa (Texas A&M) and Haskins (TCU and Penn State) have come up big in their top matchups thus far. Murray had been padding his stats against Florida Atlantic, UCLA, Iowa State, Army and Baylor, but he had yet to face a real test. He got one on Saturday, and his Heisman candidacy remains intact after his fourth-quarter heroics. Oklahoma still has games against TCU, Oklahoma State and West Virginia, so there will be opportunities for Murray to prove he can lead his team to wins in big games. Coming up small against a rival in the spotlight could prove costly, but don't sleep on Murray just because of one loss. After going 7-6 in Tom Herman's first year as coach, there were high expectations entering the season in Austin. While the Longhorns didn't get off to the greatest of starts this season with a loss to Maryland, they have found a rhythm. Beating Oklahoma will feed the notion that Texas is back—but doing it in the fashion it did means the result isn't enough to solidify the Longhorns' status as College Football Playoff contenders. The Longhorns had come close to toppling the Sooners in recent years, losing their previous two meetings by five points apiece. But in college football, close doesn't cut it. Results are all that matter. Texas entered the Red River Showdown having won four straight games on the season and worked its way back into the Top 25. With victories over then-ranked USC and TCU, the Longhorns had a solid resume, but it had spent too long in the wilderness to be taken seriously. After falling behind by a touchdown early, Texas went on a 24-3 run in the first half to take control of the game. The Longhorns offense was virtually unstoppable, and the defense did a solid job of containing Murray for three quarters. The team looked like it could make some noise down the stretch. And then the fourth quarter happened. Blowing a 21-point lead in the final nine minutes of the game is tough to overlook regardless of the level of competition. Both the offense and defense fell apart down the stretch, although Ehlinger and Co. came back to life just in time to save the day. Texas looks like the team to beat in the Big 12 after overcoming Oklahoma on a neutral field on Saturday. That Maryland loss, though, could be tough problematic. No team has ever made it to the College Football Playoff with two losses, meaning the Longhorns will have to run the table to keep their hopes alive. Texas could face an uphill battle regardless of how it fares the rest of the season. 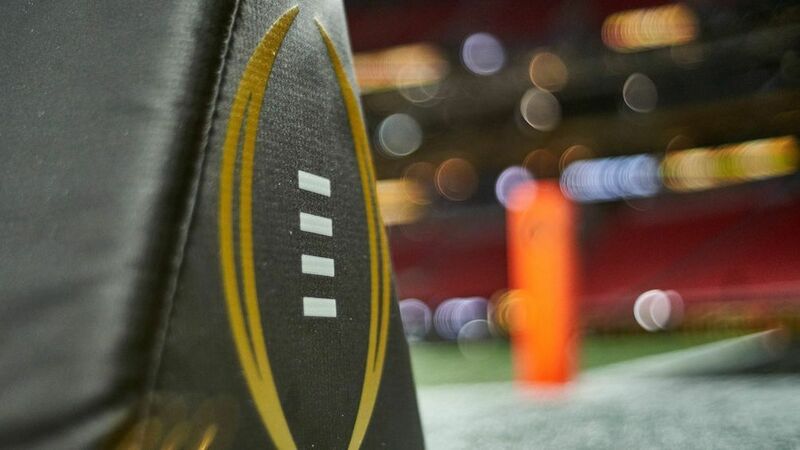 The SEC currently has three teams (Alabama, Georgia and LSU) ranked in the top five, Ohio State has already proved itself by passing a pair of tough tests in TCU and Penn State, and sixth-ranked Notre Dame is currently lurking at 5-0. With Washington (5-1 with a loss to No. 8 Auburn) at the top of the Pac-12, it wouldn't be far-fetched for Texas to get left out even with a Big 12 title. The Longhorns would have had a stronger argument had they managed to hold on to their sizable lead and blown the Sooners out. But with a fourth-quarter collapse that nearly cost them, they showed they still have some work to do to be considered among the nation's best. Oklahoma has won the Big 12 each of the past three seasons and was the preseason favorite entering the 2018 season. After Saturday, though, the Sooners are going to need some help if that streak is to continue. Only two teams remain undefeated in Big 12 play following the Red River Showdown, Texas (5-1, 3-0) and West Virginia (5-0, 3-0). Oklahoma now falls into a tie with a handful of other teams with one loss in conference play. The Longhorns and Mountaineers will meet in Morgantown, West Virginia, on Nov. 3. As of now, the winner of that game would have the inside track for the top spot in the conference and possibly be in the conversation for a berth in the College Football Playoff. College football is no stranger to chaos, so the standings could look completely different when Texas and West Virginia play. But each squad currently has a golden opportunity to grab hold of the conference and end Oklahoma's reign. Texas (5-1) will look to build on its momentum as it hosts Baylor on Oct. 13. Meanwhile, Oklahoma (5-1) will have a week to rest before hitting the road to take on TCU on Oct. 20.